The Hobbit, The Lord of the Rings, and Tolkien - The One Ring • View topic - What server are you on, and who's your character? Been a while since I've posted (I have a natural tendency to lurk), so I thought I'd post an update. and then there's wee little Rumblebelly - level 34 Hobbit Minstrel. I've been a member of the Shadow Company kinship for some time now, but I'll always be a stalwart ally of the Servants of the Secret Fire here on TORC. Feel free to add me to your friends list and call on me if you ever need a hand! Cool - I've seen folks with the name but didn't realize there was a connection. I'll check it out! I am on Vilya, and my main character is a hobbit burg named Puddy. My brother and I started the kinship Flotsam & Jetsam on day one. Yes, there are still active players. There's a kinship named Servants of the Secret Fire on Landroval that several people are members of. I'm Edhoriel on that server, if you want to say hi. ahh, can you switch your characters onto other server? I did some research and character transfers are possible with some realms. Unfortunately, Landroval isn't one of them. Leveling a character isn't hard though. My husband and I created new characters together about a week ago and are about lvl 20. And that's with me working and us taking care of our girls and my husband running around on alts leveling a bit and doing crafting. My character's name is Aubrielle and I'm (currently) a level 64 elf hunter on Arkenstone. I made her in 2008 and delved fairly deep into research to write her backstory, and even while I'm not sure her past would receive happy reception by some dedicated Tolkien students (although it might, too! ), I like it a lot and I'm keeping it anyway. I began playing during open beta in April 2007 and am still going strong. My primary character is Curulinde of the Landroval server. I started playing when it went free to play. Re: What server are you on, and who's your character? 25 level Male Human Captain by the name of Beornson who hangs around the Prancing Pony in Bree. 15 level Male Dwarf Champion by the name of Smarm who hangs around Bag End in the Shire. I'm on the Evernight server. Love the game. I just started playing this game a couple days ago, and I'm in love with it! Currently a Level 8 Elf of Mirkwood. Just bought the beorning expansion pack, and it is awesome! i have a level 23 beorning who im xp farming in the lowlands. 8 years, 7 months into this thing and I'm still playing. I have three lifetime accounts, the original a Founder. Turns out to have been a pretty good investment. ironisaac wrote: Just bought the beorning expansion pack, and it is awesome! i have a level 23 beorning who im xp farming in the lowlands. I created a Beorning recently. I've played him up to level 70. The going was a little slow at first but after awhile he really began to grow on me. It took a little while to get the knack of switching back and forth between Man form and Bear form but I think I've got it now. 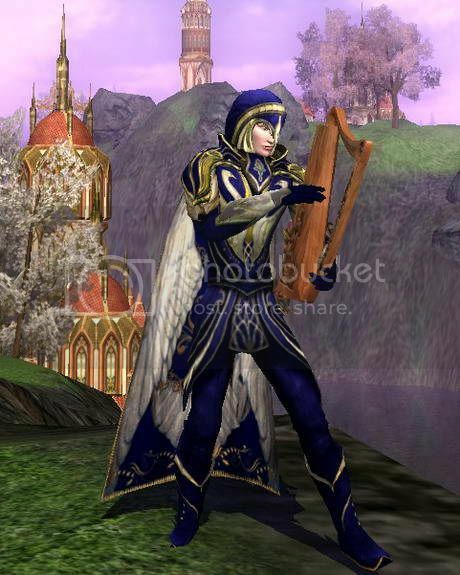 My original primary character, Curulinde the Elf minstrel, is level 100. He's in semi-retirement now, mostly coming out to do a bit of crafting. I've gotten as far as Pelargir with him. I have a few other level 100 characters, and a few more in their low 90s. I'm holding off on the Minas Tirith content until Turbine decides to finish the rest of the tier 10 crafting in terms of guild recipes, etc. With the server consolidation, hopefully many of you choose or have chosen to come to Landroval if you're on one of the servers that's closing. I played on Meneldor for a few months, creating a whole family of characters across my three accounts. When Turbine finally gets around to allowing transfers from that server I'll have to put them somewhere other than Landroval, as I have no room for them!